My goals this year are to make every room in our house work better for us. I have always loved the idea of “the not so big house” (based on the books by Sarah Susanka) which is about not building a bigger McMansion style home for more space, but focusing on the quality of a smaller one. She emphasizes featuring more quality details and spaces used to their full potential. I put the books in my Amazon shop if you’re interested! I really really love the idea of making the best of the space you have. While I have no plans to move or build a house any time the near future, I do think I can have fun continuing to develop and personalize the house I already have with things I really love and make better use of my space at the same time. Recently I talked about a new cabinet for my “gathering room” for that very reason. You might remember that I had a dresser for storage in my family room. While it has been a great storage piece for years and years (we used it in our old house dining room, too), it actually belonged to my mom and it was nearing the time to return it. So in my dreams of what to use in its place, I thought a lot about what I really wanted in this room. Meanwhile, I was patiently waiting for the right thing to come along. I was originally going to put a built-in on this wall but decided against that in favor of eventually putting built-ins on either side of the fireplace instead. I’m not sure when those built-ins will come to be, but for now, I found just what I was hoping to find for this wall! A sturdy and long but shallow closed door cabinet. The dresser that was here was a little short and a little too deep for the space so I was excited when I read the measurements of this cabinet and it was exactly the right size! I’ve mostly been a use-what-you-have girl, but sometimes what you have just doesn’t work for you. So often I can find great deals on dressers or tables at flea markets, consignment shops, or garage sales. But since I wasn’t finding anything at my usual haunts, and having zero desire or time to DIY anything, I decided to take the plunge and splurge a little to get just what I wanted. Both the cabinets I found for my “gathering room” and this room came from Restoration Hardware (neither the post nor the cabinets were sponsored in any way by RH). I knew their function and beauty would be worth it, so I placed the order (and was grateful I have a designer discount!). This cabinet was the first of the two to arrive and I LOVE it SO MUCH already! I’m on the hunt now for two new lamps to finish it off! I’ll get more pictures of the room once I have some time so you can see how great it fits in. I cannot wait to reorganize my life and continue to find the best way to use every room in our house. Here is how it looks after I got the new lamps (below). You can see the post about the lamps here! Have you ever read the Not So Big House? What are your thoughts on quality over quantity in a home? The not so big house. Sounds like mine. I have to make use of every space there is. We are in the middle of a badly needed extension, more for my sanity than anything else. But I do love the challenge of living in a tiny house. I haven’t read the book, but it sounds interesting. Yes, I’m all for personalizing a house, organizing and reorganizing it, until it fits your family in the best possible way… It’s important to love the place you’re in and little things can make such a difference. Yes, I HAVE read that book – at least twice – I was so excited to see you mention it! I’ve also read Inside the Not So Big House – and she’s got a whole collection of these books! I love the concept of “sheltered” activity areas (alcoves) and putting your money in the “little things” – the small details – that make life more enjoyable every day, like the quality of materials and the intentional design of the spaces. Mmm-mmm! Gets my creative juices flowing! Wouldn’t it be great to have the funds to design your whole house from the ground up!? Oh yes, that would be a DREAM! I’d love to design my own home top to bottom. But I’m with you, all those little details, quality of materials and intentional design is a creative feast for me, I love it!! Affirmative on Sarah Susanka’s book(S). They’re all gems. Now that it’s spring, you might want to check out (literally — the library) her Not-So-Big book for outside. She’s published by Taunton Press, + I’ve found that just about anything from this design-oriented publisher is worth a look-see. Kudos on the cupboard — nobody loves RH more than I do. LOVE the entire Not So Big House series! Actually used them to help design our home when we did a kitchen remodel & small addition. 4 peope and a dog living in under 2000 sq ft, and loving it! Quality over Quantity! I love your emails and your approach to your family HOME. It is so refreshing to see a normal-sized home with character, ongoing projects, and your budget-conscious, and sometimes…”that will have to wait until later”…honesty. I don’t want a mansion or empty rooms that are never used. I prefer a comfortable, welcoming place for my family and friends to gather together. Like you, my home has projects in process and sometimes just dreams and ideas in my head. There seems to always be something that we want to tweak, reorganize, etc. Thank you for sharing with the rest of us. It is a joy. Thank you so much, Tonya! It’s nice to share with kindred spirits!! I have been in the of process of “re-organizing” my house. We became empty nesters a year ago and I have had fun with the journey of switching my house from adult kids living at home, to a nest for my husband and I. Our house is either just us, or FILLED with 4 grown kids, spouses, and grandkids. We now have a grandkids room, complete with a loft built into the closet. Everything in the house has to be fairly grandkid proof, but pretty. And the kitchen had to be equipped for just two, or meals in minutes for the masses! Have fun with your houses! 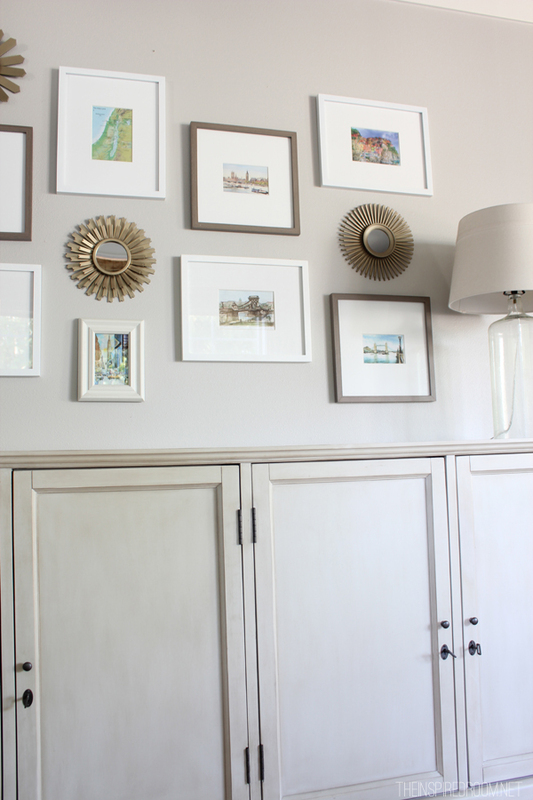 I love how simple and pared down this gallery wall looks against that gorgeous gray backdrop. I live in a teensy studio where I live/work/entertain and have gotten very used to the idea of the “perfect” not so big house. It’s all about creating double-duty/multi-functional vignettes that work for YOUR lifestyle, not the ones you see in magazines. Can’t wait to see how the rest of the space develops! That sounds wonderful, and I agree!! 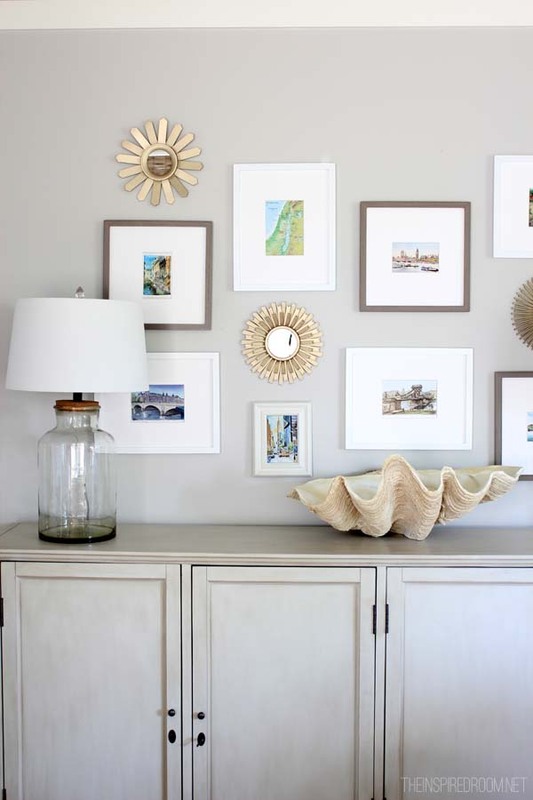 It’s fun to create a smaller space that is beautiful and works well for your life. Yes, I have read Not So Big House which is exactly what I live in. It’s been a while, however, and I think I need to look at it again as we try to make sense of some spaces around here that we’ve put up with for too long. 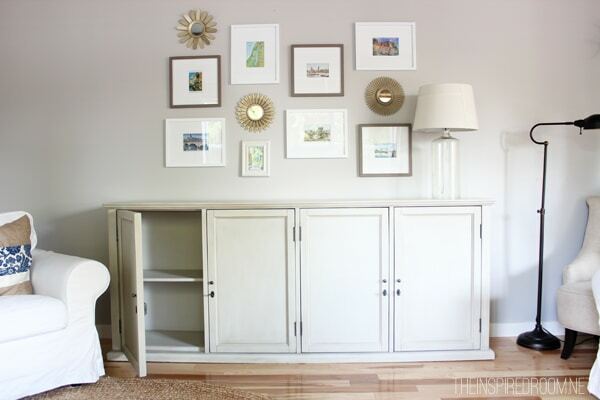 Congrats on the wonderful new cabinet – looks perfect for that space! I am going to put the Not So Big House on my Reading List! I have an average size home, about 2,000 square feet. That should be big enough, but we have way to much stuff! So recently, my husband put a whole wall of shelves up in our (thankfully dry) basement. Our basement is unfinished, but has high ceilings. I am planning to organize all the stuff upstairs that we don’t use frequently and move it all to the shelves downstairs. I plan to carefully mark everything so things can be found again! I want our living space to be living space and not storage space. I love the Not So Big House and the ideas Sarah Suzanka uses in her designs. I came across a showhouse built using one of her designs a couple of years ago. I think it was in the Chicago area. I do remember the second floor master bedroom had a wonderful deck that led to a green roof on the garage. My dreams centered on that house plan for a long time. I wish I could find it again. I was first introduced to that book in design school. I absolutely LOVE it and love the concepts! I totally agree that a smaller, more efficiently planned home is better than a McMansion! Thank you for the book recommendation. We just remarried last summer and are still exploring ways to make our existing house work for all of us (now seven under one roof!). That cabinet looks very nice in that spot. Love the light color. When you said you had to get some lamps for your new addition, my mind quickly jumped to the bargains to be had at the Bainbridge Island Rotary Club Rummage sale the last Saturday in June. Ever been? If not, you don’t know what you are missing. Biggest “garage sale” ever, and you can find all kinds of stuff. Thank you for the reminder! I’ve missed it every year so I just went and put it on my MUST DO calendar for June!! Over time, I’ve been noticing that families with large homes all seem to congregate together in one area and there is a lot of space that simply goes unused. I have also come to the conclusion that the more space we have, the more stuff we have, and the more time it takes to care for it all. I love a clean and orderly house, but frankly I have better things to do with my time than clean rarely used space. As we look forward to a move, I know that I want a large open space for entertaining lots of people and a kitchen that is large enough for two people to not be on top of each other. It would be great to have a fireplace again, two baths are a must, as is an office and area to craft/create. But, beyond that, I’m looking for porches, and patios, and room to garden. My last home was a small home with a great finished basement with tons of storage and kitchen and laundry. I didn’t think I could live in such a small place. But, I came to realize that except for entertaining I really don’t need all the space I thought I needed. I also know that I have too much stuff. Packing it up and carting it around the country has made that abundantly clear. ;) Really, when it took all day for a team of professionals to load the moving van…and the same to unload it….it’s really sort of embarrassing. Somehow I need to figure out how to live ‘light.’ I think the book might be a great read for me. Thanks Melissa! p.s. My DaySpring items have arrived! What fun! Thank you! Yes, I’ve lived in all sizes of homes and you are so right, it is all about how the spaces are arranged and designed and how you actually live in your home. Sometimes more space isn’t really needed at all, but better use of what you have! I know that clutter does seem to multiply — it is a challenge to figure out how to live with less when you are still saddled down with more :-). I have read the Not So Big House. I liked it. My husband has bought and read all of her books! Whenever we look at houses or house plans he still refers to it. She really knows her stuff! Melissa I love everything you do….you should write a book! Seriously! Thank you Teresa! ;-) I just might do that. Have a wonderful week! I haven’t read the Not So Big House but I currently live in one (family of 5 in a 2 bedroom). We inherited the house from my mother-in-law after she passed away and when my husband lost his job, it was a no brainer to move in here. At first, I thought we’d be in here a yr tops while my husband job hunts. Thankfully the job came and it was where we were so we didn’t have to move the kids again. We’ve been here 2 yrs in June and I am pleasantly surprised how much I like being in a smaller space. The boys don’t mind sharing a room (they have the master & my husband and I took the smaller room). Organization is definitely the key to being in a smaller space and purging our spaces is an ongoing activity (at least every season) but getting rid of all of the unnecessary “stuff” is so freeing. lately I’ve been wishing we still had a house under 2000 square feet. long story on why our house is bigger than I’d like, but rather than moving I’m definitely doing a lot of plotting on how to make it all more useful. you’re always a great inspiration, thanks so much for sharing this with us! I love that “buffet” cabinet. I need a long and shallow one just like it for my dining room! It’s really perfect what I need. hmmm… lol. Quality or Quanity. I think quality- but I certainly like the size of my home now. It’s around 2400 square feet. But I could go to 1500 sq ft as long as it’s open and has a big garden. Ours is quite roomy although we have been talking about downsizing lately. As long as my kitchen, family room and bedroom were roomy the rest wouldn’t matter to me really. I am very lucky..had a pretty big house to raise my three boys…now in a small brick house. I just love it so much! Although in the burbs…feels like a cottage and I can clean the whole house in about 2 hours…leaving time for fun! Love the Not So Big House. I have one of her other books also. Bought them over 10 years ago. This post is do timely! I read the book years ago and the notion that a small home can work (on many levels) better than a large one has always stuck with me. My husband, two young boys and I are about to move into our new house…all 1300 square feet of it! I’m a firm believer in the benefit of small homes, even for families with children. In our former, larger home we found that we all congregated in the same spaces leaving others unused. And I’ve purchased more than one piece of furniture just to “fill” space, so wasteful! This will be the smallest house we’ve owned but we will ensure that each room, nook, closet, and piece of furniture will serve a purpose and be lovely at the same time (I’ll be looking to you for inspiration!). We do have a large garage, an outbuilding for my work, and a playhouse for the children so that’s quite a bit of space to spread out into as well. And, because the home is so well located in a beautiful town we can walk to parks, restaurants, a museum and even a train stop to Boston. That’s worth way more to us than a bigger house any day! We are a family of 6 living in a 1200 sq ft house. We have about 600 additional finished basement square footage that we use as well. I wouldn’t ask for a larger house by any stretch of the imagination. I’m a use what you have decorator and we literally use everything we have- square footage, decor, creativity, and our imagination to make our little house a perfect home. There are a zillion reasons why this works for us but a few are:1- it allows us to actually be together- there is no hiding out in a room alone (so we do institute a ‘quiet hour’ during the day so we all can find some solitude) 2- it’s absolutely counter culture to have bigger and better but we enjoy that we make the most out of what we have and use our savings to have ‘experiences’ rather than things 3- it allows us to make updates and changes to the house bc we aren’t spending a lot on heating, cooling, furnishing etc. 4- it staves materialism and consumerism to a degree 5- it’s easier to work room by room like you are doing bc it isn’t overwhelming time wise or financially. Hi Melissa! I’m considering getting the same sideboard from RH. Is is as white as it looks in the photos, or does it have a yellowish or pinkish cast? Thanks! Love your blog and house!